I am the proud owner of a 2009 Kawasaki ER-6N. I purchased it a few months ago and have put 1,200 miles on the odometer. Prior to this bike I rode a 2007 Kawasaki Ninja 250r for 7,000 miles. 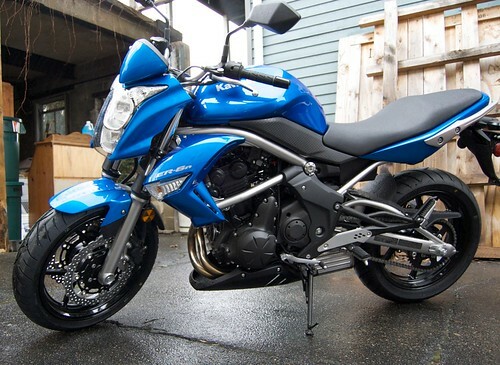 The Kawasaki ER-6n is a 650cc parallel twin and puts out about 70 horsepower. It shares an engine with the Ninja 650r . This engine puts out plenty of power for the average user. You will meet a lot of motorcyclists out there who might consider the meager 650 cc engine to be a beginner or “girl’s bike.” I think that is silly. In reality the top speed of the bike is about 130mph and the 0-60mph time is under 4 seconds – certainly faster than any sane person should ever ride on the street. Being a parallel twin this bike has plenty of low end “get up and go,” which makes the bike excellent around town. I find this bike to be very easy to ride as an intermediate rider. The clutch is very smooth and controlled and also very forgiving. Likewise the throttle is very predictable and smooth. Unless a rider is being very careless/clueless it would be hard to accidentally wheelie this bike or experience other frightening surprises. I find the overall handling of the bike to be very good. I am a small rider and appreciate the adjustable shock. At the loosest setting I found myself bouncing off of the seat when encountering the potholes that seem to be everywhere here in Boston. But at the tighter settings the bike takes the messy urban terrain well. Between the comfortable MX-style handlebars and lightweight body I really do not think about turning the bike. This bike handles the curves perfectly with very little conscious effort required. The “n” in ER-6n stands for naked! This is a naked bike, meaning it does not have full fairings. The sister bike of the ER-6n is the ER-6f – more commonly known as the Ninja 650r. These two bikes share an engine and most features. The difference is that the 650r has plastic fairings covering the engine and most of the bike, and the ER-6n does not. I’ve found the appearance of fairings is what makes the average non-rider classify a bike as a sport bike or not. For some reason, despite the bikes being pretty identical “under the hood” the average passerby would think the 650r to be the sportier bike. The marketing folk might say this bike has aggressive and sleek styling. For whatever that is worth I would say this is true. The bike has one large round headlight and two very small circular lights on top. This is a unique headlight configuration compared to the other bikes on the market and gives it a head-turning look. My riding companions have often commented on pedestrians who will stop in their tracks to watch this bike as it passes. The other interesting feature on this bike is it’s exposed frame. This look is reminiscent of the Ducati Monster or other upright naked bike. One small downside to the lack of fairing is that there is nothing to protect your legs from the hot air leaving the radiator. I find this air is expelled directly onto my right leg. In the colder months this is a great “feature,” but on hot days becomes an annoyance. The ergonomics are one of the best selling points of this bike. This bike belongs to the class of bikes that are referred to as “Standard bikes,” which means the seating position is more upright. The foot pegs are in line with your rear-end and shoulders while the handlebars in front of you so you don’t need to lean over. A lot of people look at the style of a bike like this and assume it is a race style bike, which would have you leaned over in an aggressive position. Fortunately, for my back and wrists, this couldn’t be further from the truth. A closer comparison would be the ergonomics of a dirt bike – they are a similar seating position. The other upside of this bike for me is that it is rather small in size. The seat height is 29.7 inches and weighs about 450lbs. This is slightly smaller than the 650r. The weight also sits a bit lower than the 650r making it a little easier to manage the weight. I am 5’5” (about a 29” inch inseam) with a petite build and I found these features to make the bike a perfect fit. While the ER-6n is new to the US market in 2009, the ER-6n has been sold for many years in Europe. Its sister bike, the Ninja 650r has been sold here in the US since 2006. In 2009 both bikes received an updated engine but it still based on a very reliable and proven Kawasaki engine. I’ve only had this bike for 1200 miles, not long enough to comment on the long term reliability of the bike. My past experience gives me confidence with Kawasaki that this bike will run well for many years to come. Kawasaki’s large dealer network in the US is also a plus to me, should I encounter any problems in the future. As I mentioned previously, I rode a Ninja 250 for about 7000 miles over the course of two years. During this time I was a die-hard Ninja 250 promoter and scoffed at the idea that I could need any more power. I would still argue that the Ninja 250 is a great beginner bike for someone looking to build confidence with something small and even lighter weight than the ER-6n. However, the day I pulled out of the dealership with my new ER-6n I realized what everyone was talking about. The smoothness of this fuel-injected engine was amazing. I feel like this ER-6n is even easier to ride than the Ninja 250. The 250, with its carbureted 1980’s era engine, does not offer as smooth of a ride as the more modern fuel-injected bikes. Compared to the Ninja 250 the ER-6n’s suspension and breaks are an upgrade. This lends itself to a more confident ride. I would recommend this bike for almost all riders. I think that it is tame enough that a confident beginner would not get into trouble on the bike. It might be a little too much for a rider who is overwhelmed by motorcycles and looking to start out on something small. At the other end of the spectrum an experienced rider would find the lightweight “flick-ability” of the bike combined with its low-end pep to be exciting and fun. The bike is excellent for shorter riders and those concerned about the weight of a larger bike. On the flip side someone of large stature should definitely go sit on the bike in the showroom first to see if it is comfortable. This bike is ideal for urban riding. The small size lends itself to easy maneuverability in the city while still having plenty of power for a comfortable highway ride. Add some luggage to the bike and perhaps a wind screen and I think this bike would also make a good entry-level sport-tourer. It does indeed, I put 10,000km on my 08 Ninja 650 this summer including a touring trip into BC. While I’m looking at a Monster for my next bike, I will miss how amazing the Ninja650 toured. I used soft cortech bags and had no trouble with storage space. The bike give me plenty of power for climbing and passing in the mountains. I loved every minute of the trip, I was never stiff or tired. I am only 5’4″ and I manage the height of this bike without too much trouble. I found stopping on hills challenging, but in the flat lands I have no issues. your quoting a 2010 model seat height. your 2009 model has a seat height of 30.9. the 2010 will fit you even nicer..